Need to rent a hip electric scooter for short jaunts around San Francisco? Want to causally zipin and out of all your runs for errands and feel the breeze causally on your commute. Here’s how: get your iPhone (or other smartphone, if you have one), look for a scooter, zoom in and pick one, reserve it, go to your scooter, dock your phone on the scooter, your smartphone connects to and unlocks the scooter, and you are good to go — what a smartphone does nowadays! These scooters are for short trips around the city, replacing the bus, taxi, etc. All you need is a CA driver’s license and you can rent one. Getting around the city used to be a trouble, but not now. Because scooters are so small, parking in the city now will be easy and perfect for errands. One’s daily commutes will be quite relaxed compared to the stress of finding parking and maneuvering cumbersome vehicles. 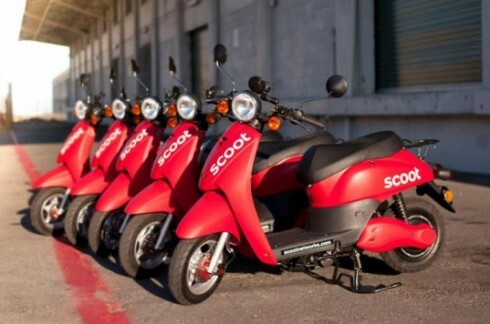 Scoot’s on-demand service means no more waiting for a ride. Time is saved by the quick action of your smartphone, and now the time is yours to enjoy. The initial locations will primarily be in San Francisco’s SOMA neighborhood, and are aimed at both residents of the neighborhood and others who work there. There will be 50 scooters in the initial deployment. As the video above notes, electric scooters are being made in huge quantities for China. This makes them affordable for us, replacing gas-chugging cars for quiet trips around the city. The company recently closed a $550,000 round of funding with several high-profile angel investors, including Tim Young (About.me, Socialcast), Lisa Gansky (Ofoto, The Mesh), & Jerry Fiddler (Zygote Ventures, Wind River). Scoot is also an alumni of the Greenstart accelerator program in SF, where it was selected as part of the top 2% from a pool of 165 startups and received a $115,000 investment from that. Sign Up Online: New users sign up on the website and pay $10 to join the service. Orientation: Scoot gives new members a quick orientation that covers how to safely ride a scooter, along with some hands-on training. Find a Scoot and ride: Members can take a Scoot out from any one of a number of locations across the city simply by plugging their phone in the Scoot’s smartphone dock. Once the scoot is started, the phone becomes the dashboard, providing members with a map, speedometer and battery gauge. Payment: Members pay by the hour ($5/hr), or a flat fee for round-trip commutes ($10/commute) during the week.